Kate Lebo grew up on the west side of Washington, and her move to Spokane a few years back came with the realization that she was now a citizen of a place considerably politically “redder” than she was used to. With that came the knowledge that Republican Rep. Cathy McMorris Rodgers, who’d spent years trying to kill the Affordable Care Act Lebo relied on, was now the poet, author and pie maestro’s representative in Washington, D.C. 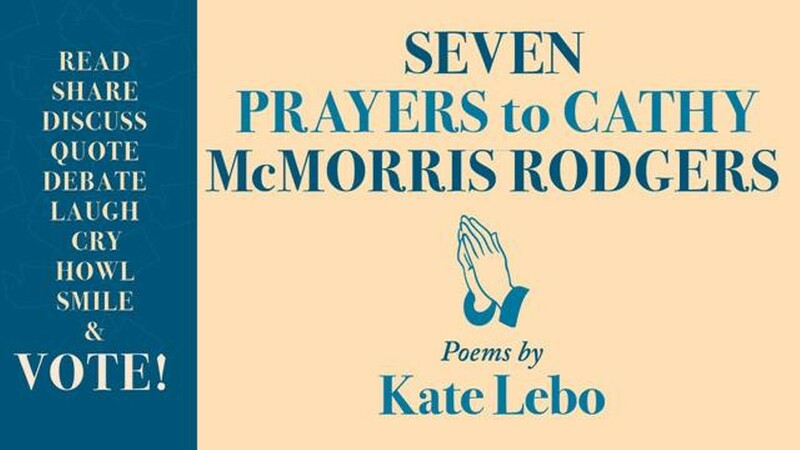 Such pistol-whippings of new clarity often make for great art, and that’s certainly true in Lebo’s case with the recent publication of Seven Prayers to Cathy McMorris Rodgers. Part witty dissection of modern politics and part letters from a concerned constituent, Seven Prayers gets a public reading that is also serving as a fundraiser for McMorris Rodgers’ opponent in the current election, Lisa Brown. Lebo will be joined by local authors/readers Laura Read, Chelsea Martin, Sharma Shields, Ellen Welcker, Nance Van Winckel and Maya Jewell Zeller.